In December 2012, we attempted to show graphically the cultural origins of about half a million directors of companies registered in the European Union (plus Switzerland). We found that twenty years after the official creation of the European Union, the European economy is still highly fragmented according national considerations (Greek companies have Greek directors, etc). – the director may have been recruited globally for his particular management skills. In the map top left, we look at the relative share of Indian directors comparatively to Indian, Chinese, Russian and Japanese directors in each country. Not surprisingly, the Indian business community is strong in Great-Britain but other strongholds include Denmark and Luxembourg. 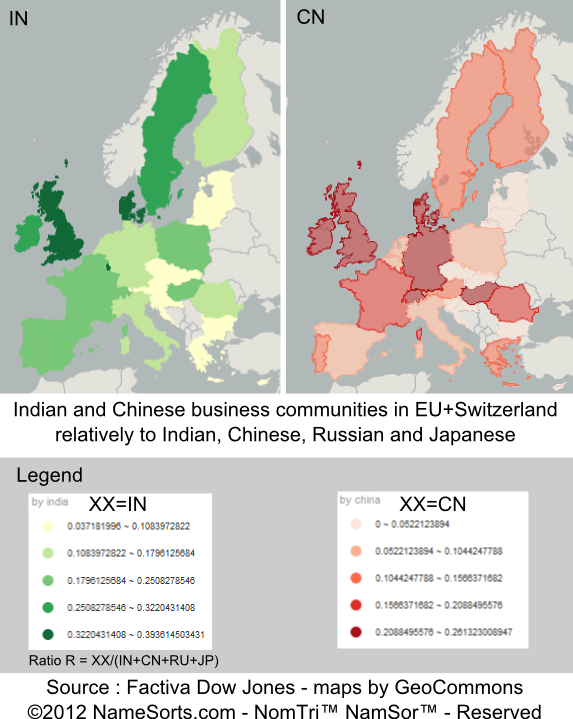 In the map top right, we see that Chinese businessmen are relatively very present in Switzerland and Germany. If Indian and Chinese businessmen seem to desert Netherland, this is due to the strong Japanese business community. In the same way, both Indian and Chinese are relatively absent from Cyprus, a location favoured by Russian businessmen to create financial holdings and redirect investments towards Russia. It’s a great job! How do you collect your names corpus for the research of this kind?